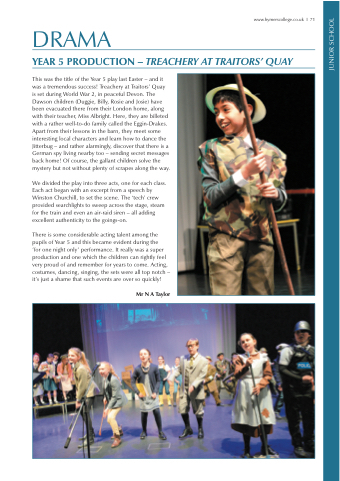 This was the title of the Year 5 play last Easter – and it was a tremendous success! Treachery at Traitors’ Quay is set during World War 2, in peaceful Devon. The Dawson children (Duggie, Billy, Rosie and Josie) have been evacuated there from their London home, along with their teacher, Miss Albright. Here, they are billeted with a rather well-to-do family called the Eggin-Drakes. Apart from their lessons in the barn, they meet some interesting local characters and learn how to dance the Jitterbug – and rather alarmingly, discover that there is a German spy living nearby too – sending secret messages back home! Of course, the gallant children solve the mystery but not without plenty of scrapes along the way. We divided the play into three acts, one for each class. Each act began with an excerpt from a speech by Winston Churchill, to set the scene. The ‘tech’ crew provided searchlights to sweep across the stage, steam for the train and even an air-raid siren – all adding excellent authenticity to the goings-on. ’for one night only’ performance. It really was a super production and one which the children can rightly feel very proud of and remember for years to come. Acting, costumes, dancing, singing, the sets were all top notch – it’s just a shame that such events are over so quickly!